LAFAYETTE, Ind. 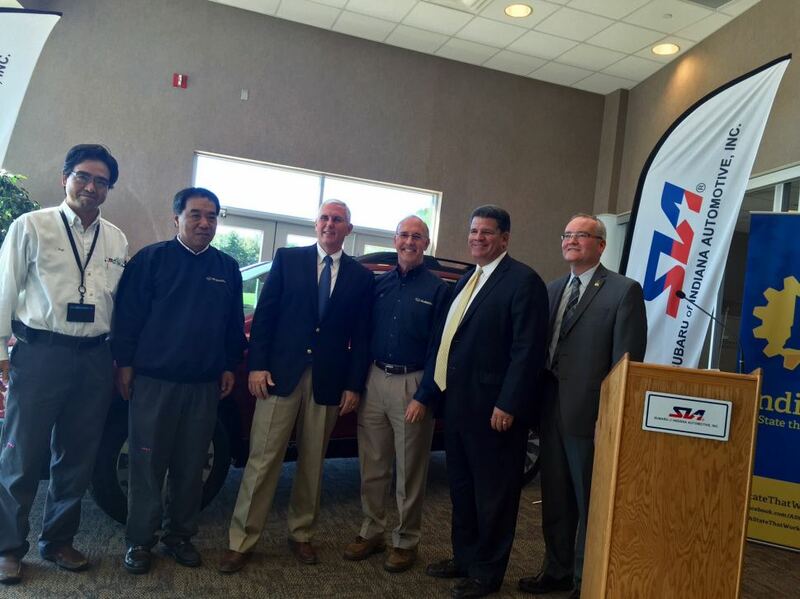 - Sept. 21, 2015 - PRLog -- Governor Mike Pence joined executives from Subaru of Indiana Automotive (SIA) today as the company announced plans to significantly expand its operations here, creating up to 1,204 new jobs by 2017. SIA will invest $140.2 million to increase its production capacity by nearly 100,000 units annually. The company will upgrade its existing campus at 5500 State Road 38 East and purchase new machinery and equipment in order to support the expansion and meet the growing demand for Subaru vehicles in North America. Established in 1987, SIA is a wholly-owned subsidiary of Japan-based Fuji Heavy Industries Ltd. and is one of only three Subaru assembly plants worldwide. SIA, which builds the Subaru Outback, Subaru Legacy and Toyota Camry, is Subaru’s only production facility located outside Japan. "SIA associates do an outstanding job of building superior quality into every vehicle, which has helped propel the Subaru brand to tremendous success in the North American market. SIA's investment of approximately $140 million and the creation of over 1,000 new jobs at SIA over the next two years will enable SIA to build more Subarus to help meet the growing demand,” said Tom Easterday, executive vice president of SIA. “The substantial increase in production volume at SIA will also result in new jobs and investment by many of our suppliers across Indiana. We greatly appreciate the support of state and local government for this significant economic development project." This news comes on the heels of Governor Pence’s recent jobs and economic development mission to Japan last week, where he met with the president of Fuji Heavy Industries in Tokyo. SIA’s investment will be in addition to its $400 million expansion currently underway, which was announced in May 2013, dedicated to a new paint shop and an expansion of the engine assembly and stamping sections to enable SIA to begin Subaru Impreza production by the end of 2016. SIA currently employs more than 3,800 Hoosiers and produces approximately 300,000 cars each year. The facility has built more than 4 million vehicles, including more than 2 million Subarus, since the start of production in 1989. The company’s expansion is also expected to spur growth of its direct material suppliers as well, including 28 located across Indiana. The Indiana Economic Development Corporation offered Subaru of Indiana Automotive up to $7,650,000 in conditional tax credits and up to $250,000 in training grants based on the company’s job creation plans. These incentives are performance-based, meaning until Hoosiers are hired, the company is not eligible to claim incentives. The city of Lafayette and Tippecanoe County will consider additional incentives at the request of the Greater Lafayette Commerce. Indiana’s economic ties with Japan continue to grow. Among all U.S. states, Indiana has the largest amount of Japanese investment per capita and is home to more than 250 Japanese business facilities that employ more than 52,000 associates. Indiana is the only U.S. state that is home to three Japanese original equipment manufacturer (OEM) automotive companies, including Subaru. A full fact sheet on the economic ties between Indiana and Japan is available www.iedc.in.gov. Subaru of Indiana Automotive, Inc. (SIA), a subsidiary of Fuji Heavy Industries, Ltd., is the home of North American Subaru production. Models built at the Lafayette, Indiana plant include the Subaru Legacy and Outback. SIA also produces the Toyota Camry under contract with Toyota. SIA employs over 3,800 associates, and every associate is committed to quality, safety and environmental stewardship. An industry leader in environmental stewardship, SIA was the first auto assembly plant in America to achieve zero landfill status, and SIA's entire 832- acre site has been designated a Backyard Wildlife Habitat by the National Wildlife Federation. SIA's community outreach programs include providing charitable contributions and corporate sponsorships, hosting charitable events on-site, donating vehicles and vehicle parts to educational institutions and encouraging Associate volunteerism, which supports hundreds of non-profit organizations and schools throughout Indiana annually. For more information, visit www.subaru-sia.com. : Subaru of Indiana Automotive, Inc.